Lou Chibarro, Jr. arrived in Washinton in 1975. 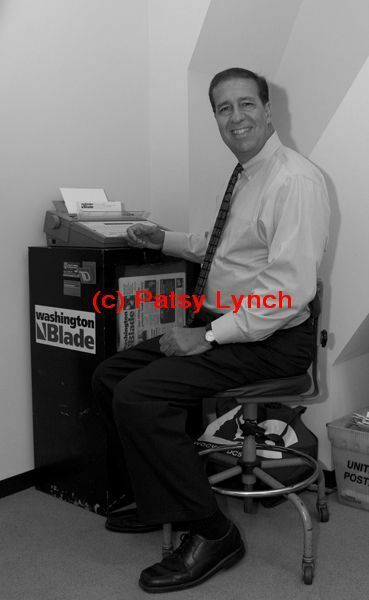 It’s difficult to imagine anyone who hasn’t heard of or met the Washington Blade’s senior news reporter, Lou Chibbaro. For thirty-four years, Lou has covered events, crimes, politics, and more in the city’s lesbian, gay, bisexual, transgender and queer (LGBTQ) lives. If the newspaper for which he writes is a pre-eminent historical source, Lou is certainly its primary recorder of that history. When first in Washington in 1971 on a DC semester from SUNY Brockport and on his return in 1975 to work and do a graduate degree in broadcast journalism, Lou was unacquainted with the city’s gay community. Using the Village Voice as a guide to gay DC in 1975, he found the Blade and Friends Radio useful new guides. In short order he found and joined the Gay Activists Alliance (GAA) during Cade Ware’s presidency. Cade became a mentor to Lou, acquainting him with the city’s gay social scene and politics. During the GAA presidency of Jim Zais from 1976 to 1977, Lou served as GAA Secretary and built an insightful understanding of local gay civil rights and politics. Gregarious by nature, Lou quickly found outlets for his journalistic skills in the gay community, freelancing for The Blade from July 1976, when his first story was on the upcoming Democratic party convention. Having made the acquaintance of Bruce Pennington and David Aiken of the Stonewall Nation Media Collective, producers of DC’s long-lived (1973-1982) gay radio program, Lou freelanced as a volunteer interviewer for the program. Among his first radio topics were an October 1975 program and a December 1975 interview with the first national gay lobbying group, Gays on The Hill. Lou’s day jobs in print journalism with Trends Publishing and later with the American Public Power Association led him to use the pseudonym ‘Lou Romano’ at both the Blade and Friends Radio. In 1978 self-employment as publisher of a public utility newsletter made it possible for Lou to use his own name in his print and broadcast gay journalism. A follow up article about the 1977 Cinema Follies fire published in the October 1978 issue of the Blade was the first to use Lou's own name. His first major investigative projects were his uncovering the world around Congressman Robert Bauman’s scandal and the Reagan era FBI ‘GayGate’ investigations and exposures. It wasn’t until 1984 that The Washington Blade made Lou’s position full time. At one point he drove a Red Top cab to make a living. “It was ideal for a freelance writer. You could rent the cab for 12 hours at a time. ” As the 1980s progressed Lou became more and more involved in chronicling the advancing challenges and toll of HIV/AIDS. It was a devastating time for him personally as well as for the community. In 1985, his award from the local chapter of the Society of Professional Journalists for a series on gay bashing was the first instance of a reporter for the gay press receiving a mainline journalism award. Lou became an early member of the DC chapter of the National Lesbian and Gay Journalists Association, serving on its board. As the Washington Blade celebrates its 40th year, Lou Chibbaro is on the verge of celebrating in 2010 his 35th year as Washington’s foremost gay journalist.